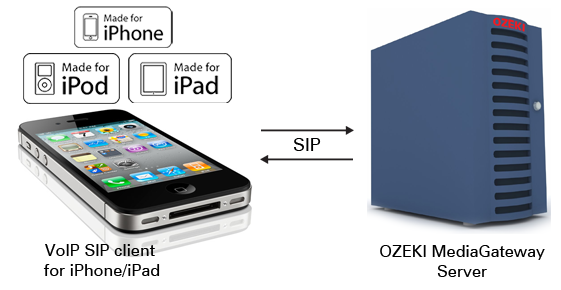 Ozeki VoIP SIP SDK makes it possible to create a VoIP client for iPhone or iPad. After reading through this page you will be fully familiar with all the essential terms concerning iPad/iPhone VoIP clients and what you will need for creating your own solution using Ozeki VoIP SIP SDK. iPad and iPhone are the latest and most innovative devices of Apple Inc. They run special operating systems like any other Apple devices and they use special tools designed only for them. Apple devices also support Internet connection therefore they are capable for voice over IP communication, too (Figure 1). Apple has special developer tools for its devices, therefore program writing is slightly different on these devices but if you want to have your own VoIP application, Ozeki VoIP SIP SDK gives you all the background for it on this platform, too. Ozeki VoIP SDK provides the support for mobile programming by using Adobe Flash technology, therefore you can use the same program code for both Android and iPhone or iPad applications. You only need to export the code to the proper format by using the File->Export menu and upload your application onto your device. To check the code explanation of the mobile applications you can create with Ozeki VoIP SIP SDK, please visit the Android mobile client building page. This article introduced you the basic knowledge about making iPhone/iPad VoIP client solutions and showed how Ozeki VoIP SIP SDK can help you to fulfill your goals. If you have read through this page carefully, you already have all the knowledge you need to start your own solution.